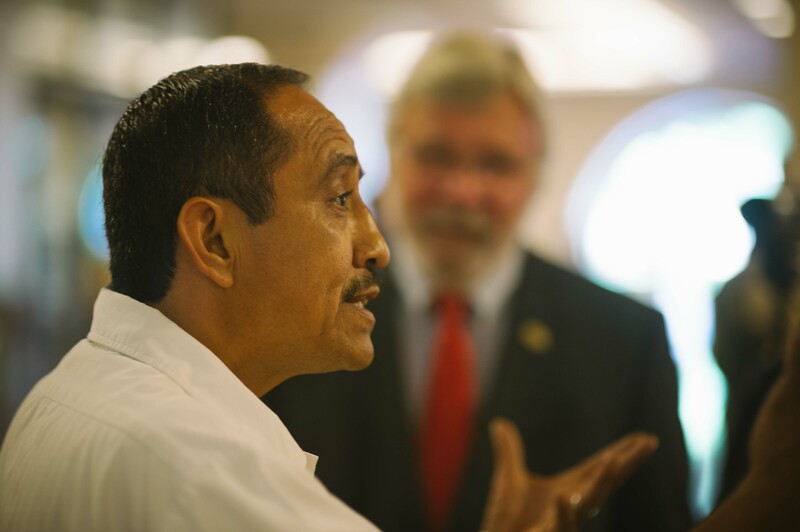 Marco Ramirez explaining the art of the shoeshine to Metro CEO Art Leahy last month. Photo by Steve Hymon/Metro. He thanks God. He thanks the leaders of the Los Angeles County Metropolitan Transportation Authority. He thanks the people who manage the station. He also thanks the members of the Los Angeles Athletic Club, where he has worked since he was 20 years old. In 31 years of conditioning Italian leather and buffing the scuffs off tassel loafers in the club’s men’s locker room, he has come to count among his friends millionaires and billionaires. Businessmen, doctors, lawyers, real estate brokers, he says, have shared their most private thoughts and opened this and other doors for him. Nice video, too. And ladies: he’ll shine your boots. The owners have been restoring the old Saban Theater that is one block east of the intersection of Wilshire and La Cienega boulevards, the terminus for phase one of the Purple Line Extension. The owners and their consultant — who is also a consultant for the Beverly Hills Unified School District in their lawsuit against Metro over the route under the Beverly Hills High campus — say they worry that problems that plagued subway construction in Hollywood 20 years ago could repeat. Metro officials say that construction methods have changed and the work should be far less disruptive than in the past. A view of part of the plaza from the gazebo. Photo by Steve Hymon/Metro. 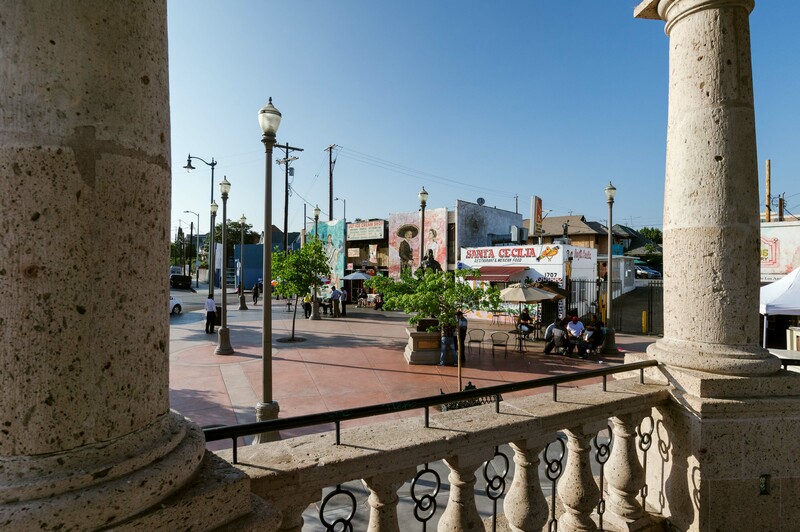 A proposed joint development by Metro and a private firm at the plaza — which sits atop a Gold Line station — has generated controversy in Boyle Heights. Musicians and residents say the initial proposal for a medical office, gym, parking structure and other shopping won’t fit into the area. Metro officials say it’s still very early in the process and there will be plenty of time for community input and the developer says that a final plan will elevate visibility of the mariachis. •The Board postponed three items on the agenda — 13, 14 and 15 — on potential new transit-oriented developments on the Eastside Gold Line, one at Mariachi Plaza and two near the Soto Station. In both the Board’s Planning Committee last week and at today’s meeting, many community members expressed concerns about the size, scale and affordability of residences in the projects. The items were postponed in order to do more community outreach, said Board Member Gloria Molina. Not every ginormous parking lot at malls around the U.S. was filled with eager shoppers on Friday. In fact, many of the sprawling lots were empty, as chronicled by readers of the Strong Towns blog. Reminder: many shopping malls and districts in the L.A. area can be reached via transit. The project aims to remove a one-mile stretch of the Terminal Island Freeway on the westside of Long Beach — which is in desperate need of open space. There’s still a long way to go before anything is demolished, but it’s interesting to see the project moving through the paces. Amazing gallery of images showing roads and a city buried in snow. I can’t recall ever seeing an interstate (or freeway, depending on where you’re reared) disappear like that under the white stuff. Oh puhleaze, not this NIMBY stuff all over again. All the while we get stuck everytime to get over NIMBY concerns, Asian countries get right at building them as soon as studies are done, no one raises a concern or issue because everyone knows more mass transit is better, they build them a lot faster and more efficiently, and they are built with the most modern advanced techniques that can withstand the largest earthquakes that’s even bigger than any seismic activity that California has experienced. There should be a law that cuts back on endless meetings, debates and studies, fix the legal loopholes that causes NIMBYs to file frivolous lawsuits, and just get right at building them ASAP. Concerning KNBC-TV’s report about the Purple Line Extension and its possible impact on historic Saban Theatre: I think the theater owners have a right to be concerned about the construction process given what has occurred in the 1980’s & early 90’s. But the bigger picture is new construction policies & practices that should not effect the Saban Theatre, and that in a decade from now more people will be taking the train along Wilshire Boulevard & less motorists on that busy thoroughfare.